The Somali Democratic Republic (Somali: Jamhuuriyadda Dimuqraadiya Soomaaliya, Arabic: الجمهورية الديمقراطية الصومالية‎ al-Jumhūrīyah ad-Dīmuqrāṭīyah aṣ-Ṣūmālīyah, Italian: Repubblica Democratica Somala) was the name that the Marxist–Leninist military dictatorship government of former President of Somalia Major General Mohamed Siad Barre gave to Somalia during its rule, after having seized power in a bloodless 1969 coup d'état. The putsch came a few days after the assassination of Abdirashid Ali Sharmarke, the nation's second President, by one of his own bodyguards. Barre's administration ruled Somalia for the following 21 years, until Somalia collapsed into anarchy in 1991. Chairman of the Supreme Revolutionary Council from 1969–1976 & after 1980. In July 1977, the Ogaden War against Ethiopia broke out after Barre's government sought to incorporate the predominantly Somali-inhabited Ogaden region into a Pan-Somali Greater Somalia. The war was part of broader SNA effort to unite all Somali territories (Soomaliweyn). In the first week of the conflict, the Somali National Army scored spectacular victories over the Ethiopian forces, surprising many American military observers who took on a position of neutrality during the war. Southern and central Ogaden were captured in the early stages of conflict and for most of the war, the Somali Army scored continuous victories on the Ethiopian Army and followed them as far as Sidamo. By September 1977, Somalia controlled 90% of the Ogaden and captured strategic cities such as Jijiga and put heavy pressure on Dire Dawa, threatening the train route from the latter city to Djibouti. After the siege of Harar, a massive unprecedented Soviet intervention consisting of 20,000 Cuban forces and several thousand Soviet advisers came to the aid of Ethiopia's communist Derg regime. By 1978, a ceasefire was negotiated putting an end to the war, despite this the majority of the Ogaden remained in Somali hands until 1980 despite the odds. This shift in support by the Soviet Union motivated the Barre government to seek allies elsewhere. It eventually settled on the Soviet Union's Cold War arch-rival, the United States, which had been courting the Somali government for some time. 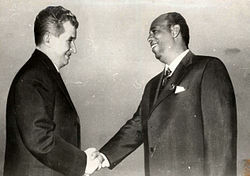 All in all, Somalia's initial friendship with the Soviet Union and later partnership with the United States enabled it to build the largest army in Africa. A new constitution was promulgated in 1979 under which elections for a People's Assembly were held. However, Barre's Somali Revolutionary Socialist Party politburo continued to rule. In October 1980, the SRSP was disbanded, and the Supreme Revolutionary Council was re-established in its place. By that time, Barre's government had become increasingly unpopular. Many Somalis had become disillusioned with life under military dictatorship. The regime was weakened further in the 1980s as the Cold War drew to a close and Somalia's strategic importance was diminished. The government became increasingly totalitarian, culminating in the Isaaq genocide (1987-1988), largely destroying several major cities and targeting members of the Isaaq clan. Estimates of civilian deaths range from 50,000-100,000 up to over 200,000. Such tactics from the government prompted resistance movements, supported by Ethiopia, which sprang up across the country and eventually led to the Somali Civil War. Among the militia groups were the Somali Salvation Democratic Front (SSDF), United Somali Congress (USC), Somali National Movement (SNM) and the Somali Patriotic Movement (SPM), together with the non-violent political oppositions of the Somali Democratic Movement (SDM), the Somali Democratic Alliance (SDA) and the Somali Manifesto Group (SMG). Barre was removed from power on January 26, 1991, and Somalia subsequently collapsed into anarchy. ^ Somaliland is not internationally recognized. 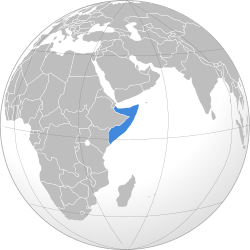 Its territory is considered part of Somalia. Somaliland authorities, however, hold de facto power in the region. ^ International Demographic Data Center (U.S.), United States Bureau of the Census (1980). World Population 1979: Recent Demographic Estimates for the Countries and Regions of the World. The Bureau. pp. 137-138. ^ la Fosse Wiles, Peter John de (1982). The New Communist Third World: An Essay in Political Economy. Taylor & Francis. p. 1590. ISBN 0-7099-2709-6. ^ a b The Encyclopedia Americana: complete in thirty volumes. Skin to Sumac, Volume 25, (Grolier: 1995), p.214. ^ a b Moshe Y. Sachs, Worldmark Encyclopedia of the Nations, Volume 2, (Worldmark Press: 1988), p.290. ^ Metz, Helen C. (ed.) (1992), "Coup d'Etat", Somalia: A Country Study, Washington, D.C.: Library of Congress, retrieved October 21, 2009 CS1 maint: Extra text: authors list (link). ^ a b c Peter John de la Fosse Wiles, The New Communist Third World: an essay in political economy, (Taylor & Francis: 1982), p.279. ^ Benjamin Frankel, The Cold War, 1945-1991: Leaders and other important figures in the Soviet Union, Eastern Europe, China, and the Third World, (Gale Research: 1992), p.306. ^ Peifer, Douglas C. (2009-05-01). Stopping Mass Killings in Africa: Genocide, Airpower, and Intervention. DIANE Publishing. ISBN 9781437912814. ^ Straus, Scott (2015-03-24). Making and Unmaking Nations: The Origins and Dynamics of Genocide in Contemporary Africa. Cornell University Press. ISBN 9780801455674. ^ Jones, Adam (2017-01-22). Genocide, war crimes and the West: history and complicity. Zed Books. ISBN 9781842771914.